Northern Ireland's Luke McCullough (left), Corry Evans (centre) and Oliver Norwood (right) during a training session at Parc de Montchervet, Saint-Georges-de-Reneins. PRESS ASSOCIATION Photo. Picture date: Wednesday June 8, 2016. See PA story SOCCER N Ireland. Photo credit should read: Jonathan Brady/PA Wire. RESTRICTIONS: Use subject to restrictions. Editorial use only. No commercial use. Call +44 (0)1158 447447 for further information. Clarets skipper Tom Heaton and striker Sam Vokes were unused substitutes as England and Wales opened their Euro 2016 campaigns in France. Roy Hodgson’s Three Lions were cruelly denied a winning start to the tournament when Vasili Berezutski’s stoppage time header rescued a point for Russia. England fully merited their lead at Marseille’s Stade Velodrome courtesy of Eric Dier’s free kick that beat goalkeeper Igor Akinfeev with 17 minutes remaining. That seemed enough until the 33-year-old CSKA Moscow defender towered above Danny Rose to send a looping header over Joe Hart from Georgi Schennikov’s delivery. 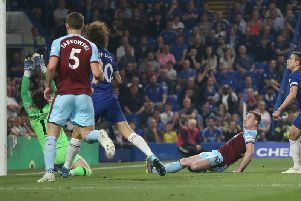 In the aftermath, Hodgson said: “When you concede with a minute left, it is a bitter disappointment. “After one dodgy spell at the start of the second half, if we take away that 15 minutes, we were in total control. “I would have been happy with 1-0. At least it wasn’t a glaring error but we go away with a draw rather than a victory. Meanwhile, Chris Coleman’s men will head in to Thursday’s crunch clash at the Stade Bollaert-Delelis in Lens as Group B leaders. Wales announced their return to major tournaments - following a 58-year absence - with a 2-1 victory over Slovakia in Bordeaux. Gareth Bale’s dipping set-piece gave the Dragons the lead at the interval. Ondrej Duda pegged them back just after the hour but Hal Robson-Kanu secured maximum points with a scuffed finish late on. “I think it is my proudest moment,” said Coleman. “Our supporters keep on topping what they have done - that support today was unbelievable. “In the second half the fans sensed we were a bit jaded and sitting back a bit. We came back and they got right behind us. Ward, who netted for the Boys in Green in their final warm-up match against Belarus, also had a spectators role as Martin O’Neill’s side opened their campaign with a 1-1 draw against Sweden at the Stade de France in Paris. Wes Hoolahan had given them the lead with a beautifully executed half-volley just after half-time but they were made to settle for a share of the spoils when Ciaran Clark put in to his own net from Zlatan Ibrahimovic’s cross. “I thought we were magnificent in the game with some really great football,” said O’Neill. “Of course the goal deflates you and there is disappointment in the dressing room, but I don’t think the players should be downhearted with their performance. Elsewhere, Burnley-born midfielder Oliver Norwood was in action as Northern Ireland’s first match at a European Championship finals ended in defeat. The 25-year-old featured for the full 90 minutes in the Group C encounter against Poland which was decided by Arkadiusz Milik’s 51st minute strike in Nice. The Ajax star fired low past Michael McGovern after being picked out by Jakub Blaszczykowski.